If you are looking for ways to make extra income without getting another job, then you’ve come to the right place. Here at Storenextdoor we’re all about doing things a little differently which is why we’ve teamed up with some partners to produce The Savvy Earner Guide! The six innovative companies featured here are all about putting the spare stuff in your life to work. 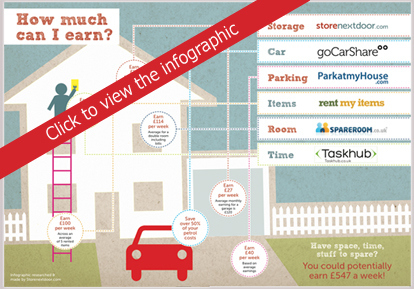 So, if you’ve got spare time, space, parking or skills, you could become a savvy earner and make up to £2368 a month extra! Check out the websites of the Savvy partners to find out more about their services, or download a copy of our free guide. Each of these pioneering businesses is an established leader in their field, helping thousands earn extra cash every month. We’ve come together to spread the word about how good it can be to put your assets to work, making money for you. Check out the website at www.savvyearner.com or download your copy of the guide.